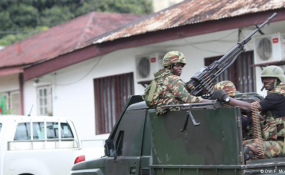 The move by the United States follows numerous accusations against Cameroonian security forces of abusing civilians in the country. Cameroon is gripped by fighting between the government and anglophone separatists in the Northwest and Southwest of the country. The United Nations says some 430,000 people in these areas have fled the fighting between security forces and English-speaking separatists, who seek independence from the largely French-speaking country. Multiple videos circulated online last year showing Cameroonian security forces shooting and killing civilians in both regions, including women with small children strapped to their backs. On a daily basis, DW receives unverified videos and photographs of people being arrested and killed. Many videos like this were documented by Amnesty International (AI) and global media outlets and prompted the decision by the US to reduce its aid. The aid in question involves armored vehicles, boats, aircraft maintenance and parts, helicopter training and an invitation to take part in a partnership program. "We do not take these measures lightly but we will not shirk from reducing assistance further if evolving conditions require it," the Pentagon and State Department said. "We emphasize that it is in Cameroon's interest to show greater transparency in investigating credible allegations of gross violations of human rights by security forces, particularly in the Northwest, Southwest, and Far North regions." France reacted swiftly to the cutting of aid by the US administration, and said on Thursday that its defense cooperation with Cameroon was continuing. The amount of money that will be withheld is massive. "We are talking of about 17 million dollars [€15 million] per year," Hans de Marie Heungoup from the International Crisis Group told DW. He said that, in addition to that, there are also military training sessions for Cameroonian soldiers that were supposed to take place in the US. Heungoup said reactions in Cameroon to the step taken by the US administration were largely positive. "First of all, civil society and human rights organizations were really happy because they [the US] have denounced cases of human rights violations by members of the Cameroonian army. Secondly, there are those who are pro-government." For them, this decision won't have any big impact on the army, Heungoup said. "They think that even if the US withdraws its military aid, they can still count on Russia and China. And then there is the state itself, which is more rational and sees this decision as a strong signal." Heungoup hopes the message might prompt the Cameroonian government to rethink the use of the military in the Northwest and Southwest regions, as well as in the extreme North region. People in Yaoundé are relieved that the US has responded in this way to the suffering of the civilian population. Pascal Tantoh, a teacher who fled the brutality between the military and separatist forces in the anglophone Northwest, says: "This is the right time. Let other nations follow. The people have been suffering a lot because of the barbaric action of the military." He says it is clear "that a military solution cannot help the situation that we are going through. So we are very happy about this step." Businessman Njowir Eric says other countries should consider imposing economic sanctions on Cameroon. "Actually, what the military has been doing is against human rights and human freedoms, so it is very appealing." He would like to see other countries follow suit "to make the government realize its actions are against our rights and freedom. I wish other powers that have been aiding Cameroon will put them aside so they try to sort out their differences in the country." Human rights organizations like Amnesty International have been concerned about the situation in Cameroon for a long time. Samira Daoud, Amnesty's deputy regional director for West and Central Africa, says that AI has been documenting breaches of human rights in Cameroon for several years. "We have several reports of systematic human rights violations committed by Cameroonian security forces, such as killings, arbitrary arrests, torture and the destruction of villages. The fact that the United States now decides to cut money because of human rights concerns is a very important step." The United States is a main partner in terms of security and military action in Cameroon, in particular in their fight against Boko Haram in the far north, Daoud added. Cameroon's government has denied killings of civilians by security forces as they combat Boko Haram, whose fighters have spilled over the Nigerian border into the Far North region and carried out bombings and other attacks. Daoud believes that the Cameroonian government does not want to blame Cameroonian security forces as they are fighting on two fronts: against Boko Haram and in anglophone areas. "The government wants to demonstrate constant support for their security forces. But what Cameroonian authorities should understand is that supporting people who are committing war crimes would neither end the conflict nor do something positive for the population." With the US sending a very strong message to Cameroon's authorities, Daoud says they are warning the government that it cannot act with impunity. The Cameroonian government needs to act without further delay, Daoud says. "We cannot wait until we have a video showing people that we can recognize killing people before there is a reaction. That is worrying. The government should take that issue very seriously." A mechanism must be put into place to ensure that such abuses will not happen again and anyone perpetrating such acts will be sanctioned. Moki Kindzeka and Wendy Bashi contributed to this article.